Before we journey on inside the body, I want to begin this exploration with a basic tour around the largest of the human organs: our skin. Not many people think of our skin as an organ but, by definition, it is in fact a sensory organ. There are three layers to our skin; the outermost epidermis, the deeper dermis and the underlying subcutaneous layer, the hypodermis. 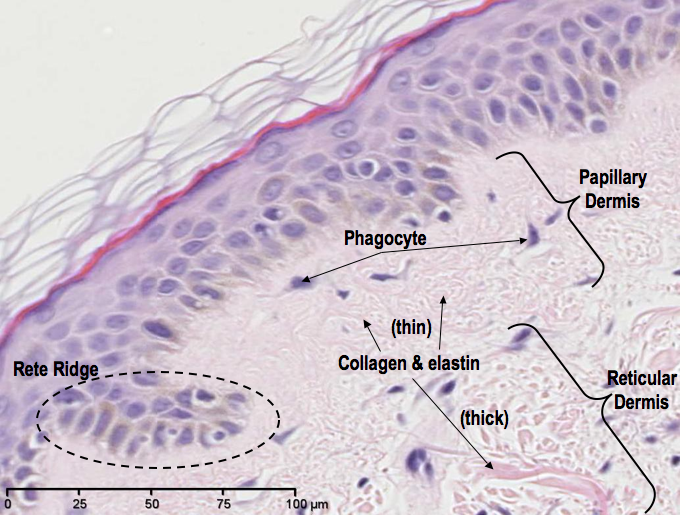 Below is a photomicrograph of a slice through a piece of skin showing the general organisation of the three layers. A micrometre (μm) scale bar is shown so you get an idea of size (conversion: 1mm = 1,000μm, 1cm = 10,000μm). The epidermis is continually regenerating. Cells at the bottom of this layer (basal cells) regularly divide and migrate to the surface with new cells sprouting from the basal cells to replenish the lower levels. Once cells leave the basal layer, they mature into a different type of skin cell now called a keratinocyte – a process known as differentiation. As keratinocytes differentiate and migrate upwards, they enlarge, die and eventually slough off. This whole process can take up to a month and we lose skin cells all of the time, but don’t worry as this is perfectly normal and our skin won’t wear away. 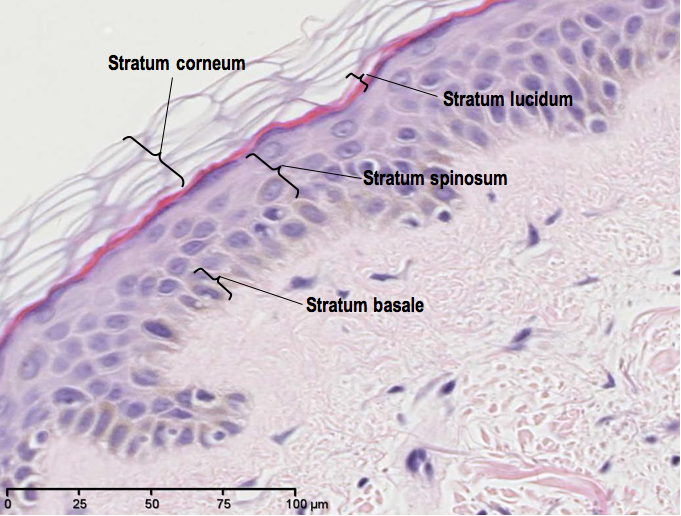 The different stages of skin cell differentiation effectively organises the epidermis into five separate layers; from the deepest stratum basale (basal cell layer), upwards through to the stratum spinosum (spinous/prickle cell layer), the stratum granulosum (granular cell layer), the stratum lucidum (clear cell layer) to the outermost stratum corneum (cornified/keratinised layer). The photomicrograph below shows the organisation of these layers, however, the stratum granulosum is not so easily defined. The dermis has just two layers; the papillary layer (which junctions with the epidermis) and the reticular layer. The papillary layer occasionally accommodates extensions of a thicker epidermis, called rete ridges – found in normal conditions. Both layers contain collagen and elastin fibres for mechanical support and some nutritional provision for the upper epidermis. The dermis also has a number of resident immune cells, such as phagocytes (i.e. Langerhans cell), just hanging around awaiting the opportunity to gobble up any invading pathogens should they break through the epidermis. Occasionally we see strands of hair crossing through both the epidermis and dermis (not shown in my own images, but you can see what it looks like here). 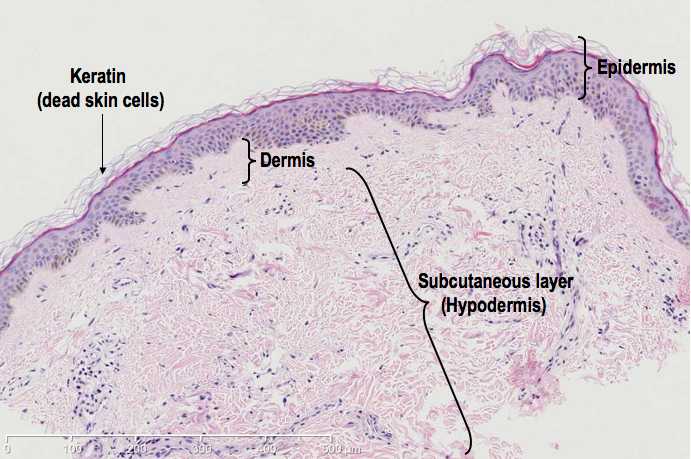 Below is a photomicrograph showing annotations of the dermal layer. Our skin can sometimes be a very useful diagnostic tool that gives us clues about what we’re suffering from, through outbreaks of distinctive rashes, lumps or bumps such as those seen in Sun-damage, eczema, psoriasis, autoimmune diseases such as systemic lupus erythematosus; or in contact dermatitis when we’re allergic to certain metals in our jewellery or when we’ve contracted a virus such as measles. The skin is our first line of defence against invading pathogens, it keeps us waterproof, it has a small level of protection against Sun damage, through it we can sense things such as touch and temperature, it helps regulate our body temperature and it’s also where our Vitamin D is made after exposure to UV rays. Sometimes it’s also a really handy colour indicator of underlying pathologies; turning yellow in jaundice, blue/grey in some heart and lung conditions, becoming very pale in anaemia and showing total loss of pigment in albinism. Pathogen barrier: the keratin on the surface of our skin is tough and so undamaged skin makes a good barrier defence mechanism against bacterial or viral invasion. In addition, keratin also protects the maturing skin cells beneath it. Waterproofing: it is the keratin in our outermost layer of the epidermis that makes us waterproof. This prevents us from ballooning out every time we bathe or go for a swim. UV protection: within the basal layer there are occasional cells called melanocytes and these produce a brown pigment called melanin. 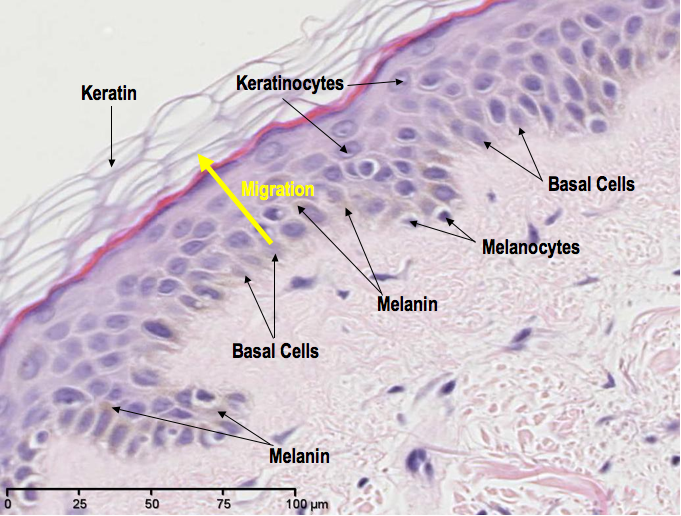 Melanin is secreted from these cells and neighbouring keratinocytes absorb it. Once absorbed, it organises around a compartment called the nucleus, which houses the cell’s DNA, to become a protective shield against the damaging, mutagenic effects of UV radiation. The more exposure to the Sun, the more melanin is produced – a process we physically see as the development of a Sun tan. If we take a closer look at the epidermis (below) we can see the melanocytes as well as the melanin-containing keratinocytes. We can also see the differences in cell shapes and sizes as they migrate from the basal layer to the surface when differentiating from basal cells to keratinocytes. Sensory: our skin is a major sensory organ that tells us information about our immediate external environment. It does this via a number of sensory receptors, more accurately called “exteroceptors”, which are found in all three skin layers (most abundantly found in the finger tips) and are further classified by the type of stimulus that they respond to. Mechanoreceptors respond to vibration, touch, stretch or pressure; Nociceptors respond to pain including heat, cold, pressure and touch and Thermoreceptors respond to temperature. As you can see there are overlaps in each of the sensory receptor’s stimuli too. Temperature regulation: most of our body temperature is generated by our larger internal organs such as the liver and brain and it is important that we sustain a constant internal temperature to keep them running effectively. Thermoreceptors in our skin tell us about the temperature outside the body and from this information our body can determine whether it needs to cool down or heat up; a feedback mechanism known as homeostasis. In hot climates, our skin helps us to cool down by signalling for the production of sweat from glands found in the dermis and hypodermis. Sweat reduces the body temperature by evaporative cooling. Also in these layers, the signals from the thermoreceptors that indicate a rise in external temperature cause the dilation of our skin’s arterioles (vasodilation), which increases the blood flow to the surface and allows for heat to escape, thus cooling us down. 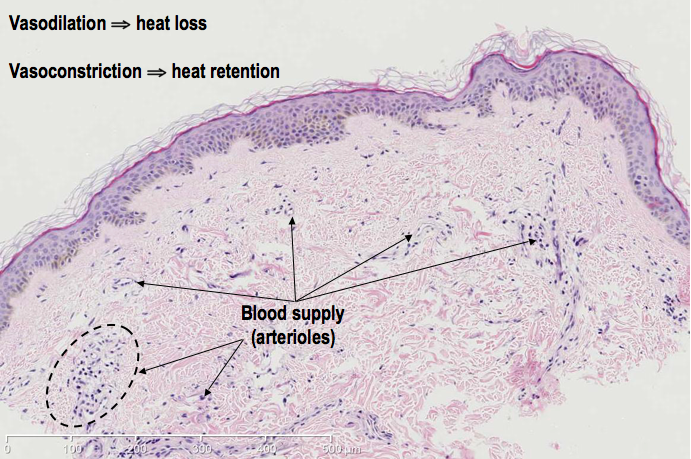 In cooler climates, first of all, keratin works as a good insulator that prevents major heat loss from the body; additionally thermoreceptors induce the constriction of the arterioles (vasoconstriction) to retain heat by restricting the blood supply to the skin and directing it elsewhere, deeper in the body. In addition, tiny muscles attached to our body hair contract and cause our hairs to stand up – with this action, the muscles can be seen as tiny raised lumps on our skin, which we call goose-bumps. This slight lifting of the hair traps heat underneath them to create a small insulating layer in an attempt to warm us up. Vitamin D synthesis: vitamin D is vital for bone health but our dietary intake alone is not enough to meet the recommended levels that we need for this. Luckily for us, we can actually produce our own. In our basal layer, we store a cholesterol-precursor called 7-dehydrocholesterol, which reacts with UV (more specifically UVB) and converts into vitamin D. Vitamin D deficiency is very common and this is no surprise given our day and age of raised awareness of the link between Sun exposure and risks of skin cancer; with much advice to keep covered up or use Sun lotion – all of which prevent us from getting our recommended daily dose of vitamin D. Effects of this are becoming evident, as this article reports recent cases of rickets, a condition often thought to reside in the nineteenth century only, but not anymore. Colour change: the colour changes in our skin are usually linked either to what’s going on in the superficial blood supply flowing through it, or the amount of pigment the skin contains. For example, when our body temperature increases and we undergo vasodilation, our skin becomes redder in colour due to the increase blood flow in that area. When someone has jaundice, the skin turns yellow because of the increased amount of a yellow breakdown product of heam (called bilirubin) in their blood, which may be indicative of some hepatobiliary condition such as hepatitis, liver cancer or gallstones. In anaemia, the reduced number of red blood cells result in a paler appearance of the blood and so our skin also appears paler. When skin turns blue, this is a result of dangerously low oxygen levels in the blood (hypoxia) and this can be caused by chemicals such as aniline dyes or by severe heart and lung conditions such as Tetrology of Fallot and chronic obstructive pulmonary disease, respectively. In albinism, the skin is completely stripped of pigment, as is the hair and eyes, and this is caused by the loss of, or impaired action of, an enzyme (tyrosinase) involved in melanin production. Skin cancers are another group of pathologies that can be characteristic. Our skin is easily accessible and easy to monitor when keeping a look out for new lesion eruptions or possible changes to existing moles. We have the great advantage of being able to spot these changes early on and have the lesion removed before they progress into something more aggressive. Here’s a simple skin “ABCDE” self-exam for checking for those skin changes we might experience. It pays to keep an eye out. All images are Copyright © 2011 Della Thomas, unless otherwise stated. « OGG or not OGG? That is the question.